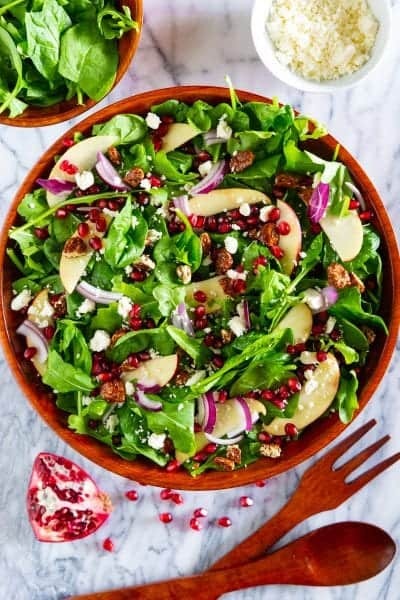 This flavorful spinach pomegranate salad is full of seasonal ingredients that are packed with antioxidants. Perfect recipe to any meal or special event. This salad pairs perfectly with my grilled chicken kebabs and panko crusted salmon. It’s a fresh menu perfect for summer or winter parties. This recipe was originally posted December 6, 2016, we’ve tweaked it a bit since then. This post may contain affiliate links. Read my disclosure policy here. 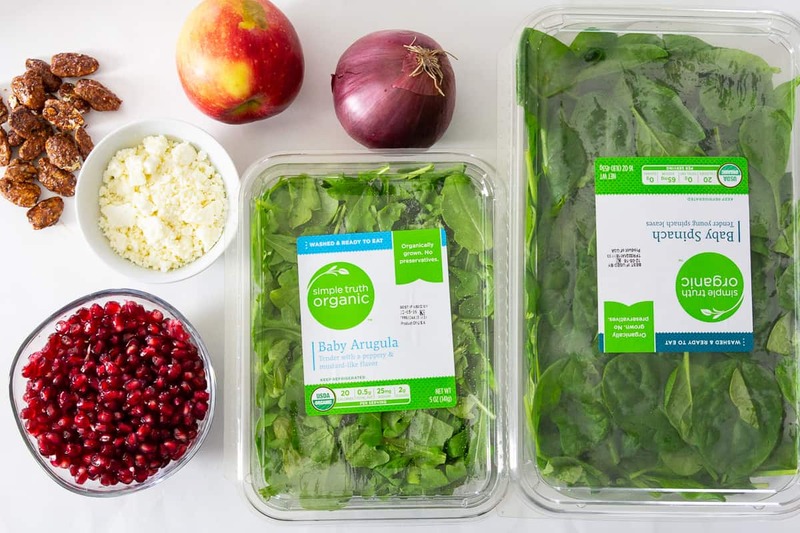 This spinach pomegranate salad is just the right side dish to add to your holiday spread. With all the rich foods at the table during the holidays, it’s always nice to throw in something light. 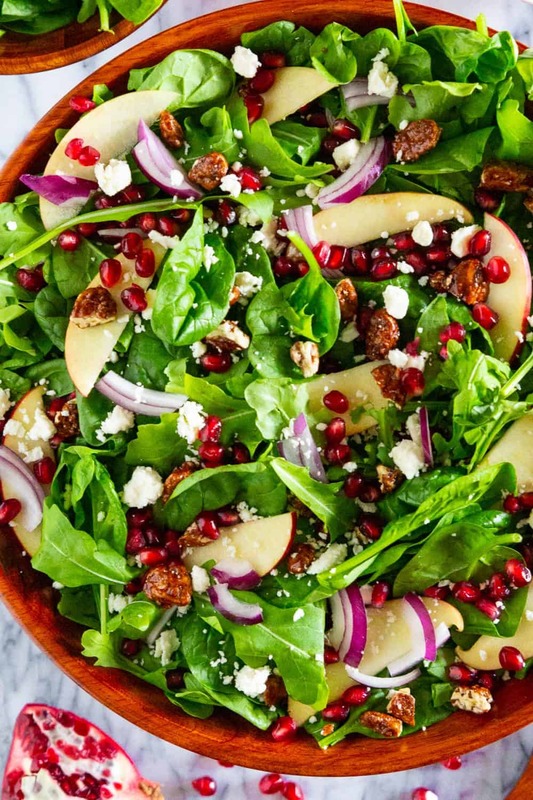 This spinach salad is nutritious and loaded with fresh seasonal ingredients. The pecans and pomegranates provide a satisfying crunch, along with many antioxidants. The balsamic vinaigrette plays a big role in providing the main flavor of this dish. It’s an easy 5 ingredient dressing that can be whipped up in minutes. And you just can’t beat homemade dressing. Make sure to cut the apple right before serving so the slices don’t brown as quickly. I have the complete salad recipe in the printable recipe card further below. But here’s a general overview of what all goes into my salad. Mix the salad dressing ingredients together. Slice the red onion and apple. Arrange all of the ingredients into a large bowl. Then drizzle with the balsamic vinaigrette and mix. Eat fresh. Since this is such a light salad, I prefer to pair light meats with it too. My favorite meat to serve with spinach sald is chicken. But you can also serve it with pork chops or turkey. 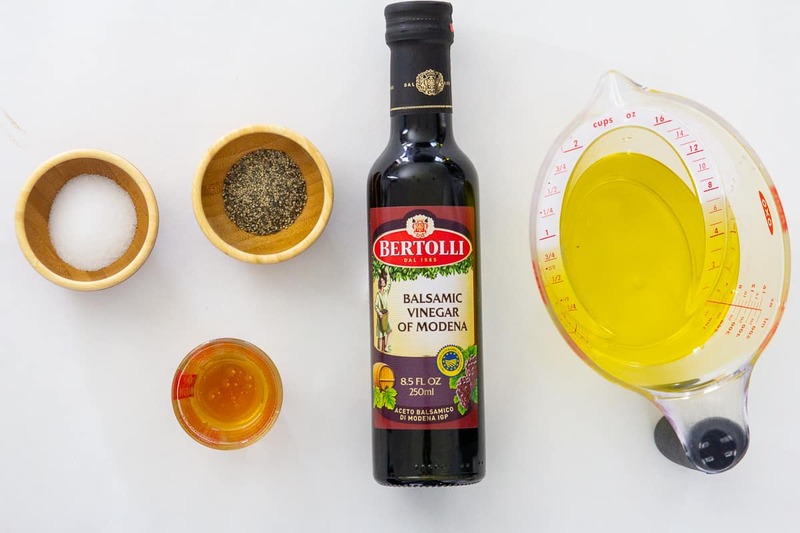 Combine olive oil, balsamic vinegar, honey, salt, and pepper in a small bowl. Whisk it until well homogenized. Arrange all of the ingredients into a large bowl. Then drizzle with the balsamic vinaigrette and mix . Eat fresh.